Save 15% on All Annual Email Package!! Enter Voucher Code: DFGMQTWX. Offer Expires: 28th February 2014. Get Now Email Hosting. Personalised email hosting wherever you are. Save £10 on 10 Year .CO.UK Domains!! Save £10 on 10 Year .CO.UK Domains. Enter Voucher Code: CGKLNPWY. Offer Expires: 28th February 2014. Get Now. All 1 Year .UK Domains £5. All 1 Year .UK Domains £5 (.co.uk, me.uk and org.uk). Enter Voucher Code: AGLQRSVY. Offer expires: 28th February 2014. Get Now. Save 10% Off All Orders Over £50 (*can’t be used in conjunction with any other promotion*). Enter this Voucher Code: BDEIKPSV. Offer Expires: 28th February 2014. Save 40% on All SiteMaker Packages!! Create a Website Yourself. Quickly & Easily. SiteMaker Sale – Save 40% on All SiteMaker Packages!! Take Web Hosting Sale – Save up to 33%!! Web Hosting. Get your website online today!! Take Web Hosting Sale – Save up to 33% Off. Save £10 OFF 10 Year .co.uk Domain Registrations. 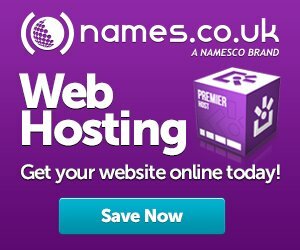 Save £10 OFF 10 Year .co.uk Domain Registrations at Names.co.uk. With Voucher Code: CGKLNPWY. Get Now. Take 40% OFF All Annual SiteMaker Packages. Create a Website Yourself Quickly & Easily. Take 40% OFF All Annual SiteMaker Packages - Now with HTML5. Get 60% OFF All Annual Hosting Packages! Get 60% OFF All Annual Hosting Packages (Professional/Premium/Platinum). And Use this Voucher Code: BHJKRSVZ at checkout. Get 20% OFF All Orders! Get 20% OFF All Orders at Names.co.uk! With Voucher Code: AEFIKNRZ during checkout. Welcome to names.co.uk, the new home of Namesco! We offer domain names, web hosting, email hosting, ecommerce solutions, dedicated servers, VPS and search engine optimisation tools, built on our cloud platform, giving you even greater peace of mind.